The bigotry-rooted horrors of the first two weeks of the Trump administration have been coming at dismayed Americans almost faster than we can keep up with them. Those who are reeling, from today's appointment of civil rights slackard Jeff Sessions as Attorney General, yesterday's nomination of Neil Gorsuch—who has ruled that autistic students don't deserve equal education rights—for the empty Supreme Court justice seat, or public schools enemy Betsy DeVos's pending confirmation as Secretary of Education, may be wondering who we can rely on to protect our community's rights. I have an answer for you: Tom Perez. Former Obama Labor Secretary Perez is running for chair of the Democratic National Committee, the organization that guides the Democratic Party's strategy and policy and which will decide on new leadership next week. And he is a champion for disabled Americans. I already had high hopes for Perez before last week, as I wrote at The Establishment: "We need a leader like Perez, a former civil rights lawyer, if we are to protect the rights and well-being of people with disabilities and push back productively against Trump’s discriminatory beliefs, staff, and supporters. " Then, a few days ago, I was fortunate to join a disability-centric conference call with Secretary Perez, and got even more specific information about how Perez can protect the rights of autistic people and students, and— importantly—what he thinks we can do individually to make a difference. As Ari Ne'eman, Autistic Self Advocacy Network co-founder and past president noted in his introduction to Perez, "Not only does Tom get our community, but he also has a history of taking on our fights — and winning them." 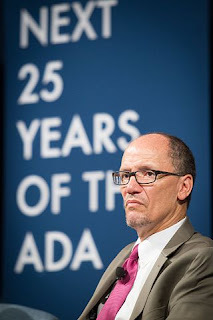 He went on to note that Perez has been unique in fighting for the disability community's rights as equals, not as a second-tier minority group, or second-class citizens, in schools, in communities, and in workplaces. When Perez himself got on the call, he emphasized the role partnerships play in the kind of transformations we need to make happen, for instance the team effort behind his enforcement of the Olmstead decision in Virginia, which gave thousands of people with disabilities living in institutions "meaningful" opportunities to live in the community instead. He didn't champion those disabled Virginians' rights on his own—he worked with teams of lawyers from Legal Aid and other civil rights organizations. In other words, we are stronger when we band together—ideally, with leadership like Perez inside government, and with expertise-laced partnerships outside of government. Perez also emphasized the need to challenge the status quo, and not be complacent incrementalists. He says he would never have been able to effectively challenge and secure the rights for people with disabilities in states like Georgia and Delaware without "cracking a few eggs," and going up against fierce challenges from both Republican and Democrat Governors. When I had the chance to ask Perez directly what individuals like me and you can do to make a difference, his answer was to "run for office," and get involved. He assured me that "if you do, the DNC will provide training." He said that the Democratic Party is the party of opportunity, and needs to recruit more people. He wants to hear about the issues that matter to people, especially about the issues that "keep you up at night," so that the party can take action. Please, follow Secretary Perez's lead, and take action. And until next week, I'll be crossing my fingers and toes that his party sees fit to elect him as their chair.